No one know the kinds of questions patients may have about their teeth better than patients! I wanted to answer a few of them here. My top front teeth are uneven–I think because I am grinding my teeth at night. It seems like I’ve literally ground some of my front teeth down. Is there anything I can do to restore them and prevent future problems?Thanks! Thanks for the question Jim. The answer, simply, is yes you have several options for restoring your teeth and keeping them looking their best. Why Fix My Chipped Teeth? Well, small chips inevitably lead to bigger chips and even tooth fractures down the road. It is easier to fix a small chip now than a cracked tooth later. Also, as teeth chip away, patients can begin to experience sensitivity to hot or cold. Over time this can become very uncomfortable. Even more so if the chip extends through the outer hard enamel of the tooth into the inner dentin. You can tell dentin from enamel by the color. Dentin is always more yellow-orange than the white outer enamel. Dentin is much softer and porous than enamel. Once worn through to the dentin, the tooth will begin to wear much faster. Because dentin is soft it is also more susceptible to sensitivity and cavities. What Can We Do To Fix Them? We can use composite to bond to the chipped areas, filling in the voids. 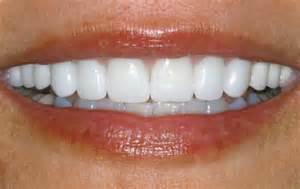 Aesthetically these restorations match the existing tooth color and are easily polished. A negative would be that the lifespan of bonding is not as long as some other options. They can also be knocked loose if a patient grinds his teeth, or has a heavy bite. This restoration can be used for small sized chips. A second option to restore chipped areas would be veneers. This is an all-porcelain restoration that completely covers the front surface of a tooth. It is fabricated in a lab and bonded in place with a very strong cement. A small amount of tooth reduction is required to make room for it once seated in place. This reduction allows for esthetic changes to be made to a patient’s smile such as straightening the teeth, changing the shape, or even selecting a lighter shade. Veneers can also mask some moderate staining. They are also used for small to medium sized chips. The third option is a crown. A crown is similar to a veneer in that it is usually all-porcelain, except that covers the entire surface of the tooth. 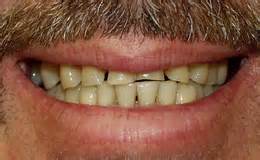 Also fabricated in a lab and cemented in place, a crown requires slightly more tooth reduction. Crowns give patients maximum strength and ability to to make esthetic changes. Misaligned teeth can be straightened, any chips and cracks will disappear, and tooth color can be drastically whitened. Crowns can be used for fixing any size chips, small to large. Finally, we have to consider the cause of any chipping and how to prevent it. Did you get hit in the face with a soccer ball? Did you bite down on something hard? Or is it more complicated like you clench or grind your teeth at night? Do you just naturally have a very heavy bite? 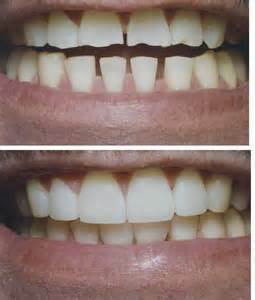 If the chips are due to some sort of one-time trauma, then you should be okay with a composite or veneer. If the problem is more systemic, like grinding, then crowns could be the answer. Regardless of the the restoration, a tooth grinder should absolutely have his or her dentist fabricate a nightguard for them. 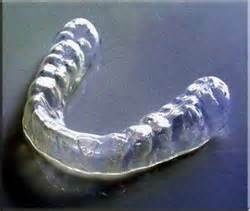 Not only will it protect the new crowns, it protects the other teeth as well, while helping prevent future TMJ problems. It is also worth discussing some stress-relieving exercises with your dentist that may help reduce teeth grinding. If a person’s bite is just very “heavy” orthodontic treatment (braces) might be the most ideal solution. We have a plethora of options for patients with this very common complaint. Basically, you don’t want to wait. Taking care of those chips now can save you a lot of trouble in the long run. For more information about bonding, veneers, crowns and nightguards, or how our doctors can help you, contact us today. nextAre Porcelain Veneers Right for Me?